Montreal’s Highlight Festival is Back on February 21! Is it too cold to get out? Would you rather curl up under a blanket and hibernate until spring arrives? Of course not! We want our EC Montreal students to embrace winter and all its magical glory. It might be a little cold for our students who came to take English or French classes in Montreal, but there is one thing you must experience while in Montreal before or if you decide to hibernate – Montréal en Lumière, called Montreal’s Highlight Festival in English runs from February 21 to March 3. 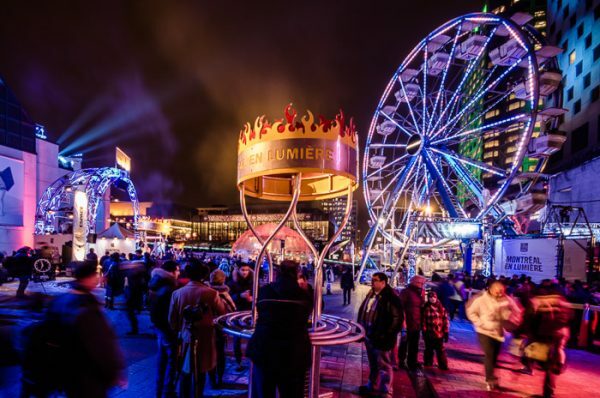 This 10-day festival, which is one of the largest winter festivals in the world, features hundreds of exceptional gastronomic and wine tasting activities, shows, exhibits, concerts and a free outdoor illuminated site right outside Place des Arts, which is called Le Quartier des Spectacles. There will be a Ferris wheel, slides and an Illuminart exhibit. Montreal has a festival no matter the season and no matter the weather. We are not afraid of the cold – we know how to enjoy the season! The weather surely doesn’t affect Montrealer’s spirit to enjoy life! Bundle up and come out with us, you might as well enjoy the Canadian winter! Study English courses in Montreal and experience the city!